Tax experts said the notices have come even after clarifications were provided following the service tax notices to the banks in April. “We understand that industry has represented to ministry of finance. The GST FAQs also in a way accepts that free supply cannot be treated as consideration for maintaining minimum balances in bank accounts,” said Dharmesh Panchal, deputy indirect tax leader at PwC India. Industry experts said if the same principle is used, then other sectors that give volume or other types of discounts could also be served tax demands. “Levy of GST on discretionary charges levied by banks for nonadherence of certain parameters would increase the cost to certain categories of customers, in addition to opening avenues for many more similar cases where charges are levied without any underlying services. Many other businesses will be watching the developments in this space as technically there could be a need to pay GST on such charges in terms of Schedule 2 of the CGST Act,” said MS Mani, a partner at Deloitte India. The GST notices have also been issued to multinational banks DBS Bank and Citibank, said people aware of the matter. SBI, HDFC Bank, ICICI Bank, Punjab National Bank, Axis Bank, DBS Bank and Citibank did not respond to ET’s queries. 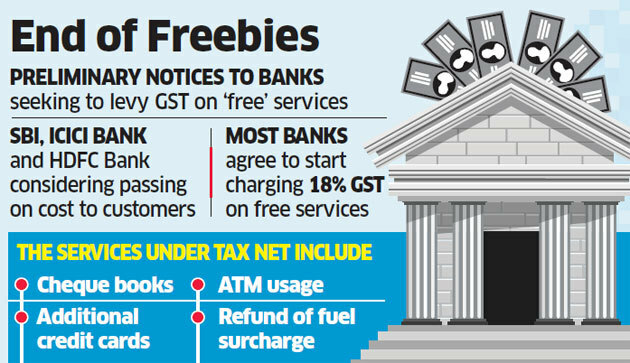 “Most banks could start charging GST from December. While banks would not pass on the service tax burden to customers for now, that too could happen in future as we think the revenue department is sticking to its position,” said Kannan of IBA.